In this technique the restoration is fabricated outside of the mouth using the dental impressions of the prepared tooth. Common indirect restorations include inlays and onlays, crowns, bridges, and veneers. Usually a dental technician fabricates the indirect restoration from records the dentist has provided of the prepared tooth. The finished restoration is usually bonded permanently with a dental cement. It is often done in two separate visits to the dentist. Common indirect restorations are done using gold or ceramics. Greene Vardiman Black classified the fillings depending on their size and location. Class I Caries affecting pit and fissure, on occlusal, buccal, and lingual surfaces of posterior teeth, and palatal of maxillary incisors. Dental Amalgam is widely used because of the ease of fabricating the plastic material into rigid direct fillings, completed in single appointment, with acceptable strength, hardness, corrosion, and toxicity properties. It is more forgiving of preparation and technique than composite resins used for that purpose. It is now mainly used for posterior teeth. Although the mercury in cured amalgam is not available as free mercury, concern of its toxicity has existed since the invention of amalgam as a dental material. It is banned or restricted in Norway, Sweden and Finland. See Dental Amalgam Controversy. Dental composites, also called "white fillings", are a group of restorative materials used in dentistry. 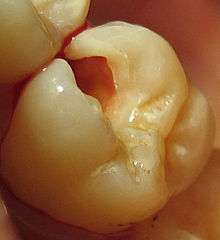 Crowns and in-lays can be made in the laboratory from dental composites. These materials are similar to those used in direct fillings and are tooth-colored. Their strength and durability is not as high as porcelain or metal restorations and they are more prone to wear and discolouration. As with other composite materials, a dental composite typically consists of a resin-based matrix, such as a bisphenol A-glycidyl methacrylate (BISMA) resin like urethane dimethacrylate (UDMA), and an inorganic filler such as silica. Compositions vary widely, with proprietary mixes of resins forming the matrix, as well as engineered filler glasses and glass ceramics. The filler gives the composite wear resistance and translucency. A coupling agent such as silane is used to enhance the bond between these two components. An initiator package begins the polymerization reaction of the resins when external energy (light/heat, etc.) is applied. Full-porcelain dental materials include Dental porcelain (porcelain meaning a high-firing-temperature ceramic), other ceramics, sintered-glass materials, and glass-ceramics as indirect fillings and crowns or metal-free "jacket crowns". They are also used as in-lays, on-lays, and aesthetic veneers. A veneer is a very thin shell of porcelain that can replace or cover part of the enamel of the tooth. Full-porcelain restorations are particularly desirable because their color and translucency mimic natural tooth enamel. One of the advantages of computerized dentistry (CAD/CAM technologies) involves the use of machinable ceramics which are sold in a partially sintered, machinable state that is fired again after machining to form a hard ceramic. Some of the materials used are glass-bonded porcelain (Viablock), "lithium disilicate" glass-ceramic (a ceramic crystallizing from a glass by special heat treatment), and phase stabilized zirconia (zirconium dioxide, ZrO2). Previous attempts to utilize high-performance ceramics such as zirconium-oxide were thwarted by the fact that this material could not be processed using the traditional methods used in dentistry. Because of its high strength and comparatively much higher fracture toughness, sintered zirconium-oxide can be used in posterior crowns and bridges, implant abutments, and root dowel pins. Lithium disilicate (used in the latest Chairside Economical Restoration of Esthetic Ceramics CEREC product) also has the fracture resistance needed for use on molars. Some all-ceramic restorations, such as porcelain-fused-to-alumina set the standard for high aesthetics in dentistry because they are strong and their color and translucency mimic natural tooth enamel. Not as aesthetic as porcelain-fused-to-ceramic, many dentists will not use new machine-made "monolithic" zirconia and lithium disilicate crowns on anterior (front) teeth. Inlays and onlays are more expensive indirect restoration alternative to direct fillings. They are supposed to be more durable, but long-term studies did not always detect a significant lower failure rate of ceramic or composite  inlays compared to composite direct fillings. Socket preservation is a procedure to reduce bone loss after tooth extraction to preserve the dental alveolus (tooth socket) in the alveolar bone. A platelet rich fibrin (PRF) membrane containing bone growth enhancing elements can be stitched over the wound or a graft material or scaffold is placed in the socket of an extracted tooth at the time of extraction. The socket is then directly closed with stitches or covered with a non-resorbable or resorbable membrane and sutured. ↑ TCT magazine, "WorkNC Dental at the "CAD/CAM and Rapid Prototyping in Dental Technology" conference"
↑ Christian F.J. Stappert, Wael Att, Thomas Gerds, and Joerg R. Strub Fracture resistance of different partial-coverage ceramic molar restorations: An in vitro investigation J Am Dent Assoc 2006 137: 514-522. ↑ "Where and When Is It Appropriate to Place Monolithic vs. Layered Restorations," Inside Dentistry, August 2012, Vol. 8, Issue 8, E. McLaren, R. Margeas, N. Fahl. ↑ Van Nieuwenhuysen JP, D'Hoore W, Carvalho J, Qvist V (2003). "Long-term evaluation of extensive restorations in permanent teeth". Journal of Dentistry. 31 (6): 395–405. doi:10.1016/s0300-5712(03)00084-8. PMID 12878022. ↑ Composite resin fillings and inlays. An 11-year evaluation. ; U Pallesen, V Qvist; (2003) Clin Oral Invest 7:71–79 doi:10.1007/s00784-003-0201-z Conclusion:.." Considering the more invasive cavity preparation and the higher cost of restorations made by the inlay technique, this study indicates that resin fillings in most cases should be preferred over resin inlays." ↑ Guentsch et al. (2010). Biomimetic Mineralization: Effects on Human Enamel In Vivo. Advanced Engineering Materials.